Last week, a journey of a thousand steps took me to a mystical meadow, where food springs from the earth as if summoned by an invisible hand. Not really. 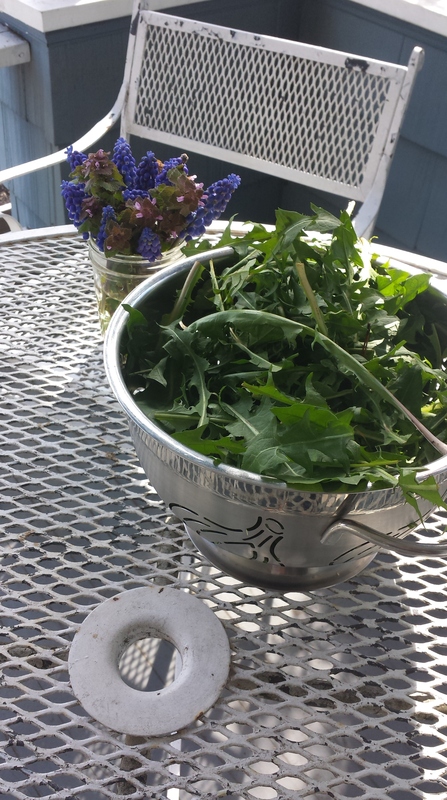 What happened is: I walked a few blocks away to an overgrown, underused alley, where I picked some dandelion greens to eat. It sounded better as a fairy tale, didn’t it? I live in a historic (old) neighborhood where many of the original alleyways built in the early 1900s are still in use (as empty Doritos bag relocation programs). Nearby, though, there’s an alley that’s too narrow for car traffic and doesn’t seem to get a lot of foot traffic, either. 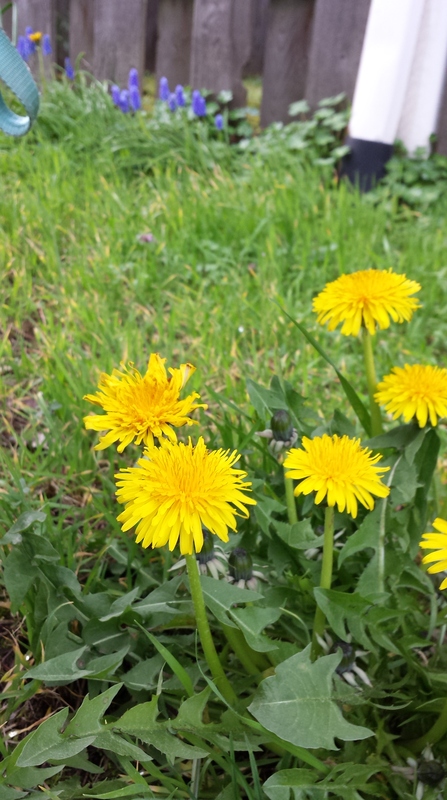 I noticed an overgrowth of young dandelions while walking past the other day, and thought, “why not?” The lack of exhaust fumes, chemical sprays, and dog urine was appealing to me, when thinking about eating the fruits of my labor, so I leashed up ol’ Daisy and we headed out on an adventure. 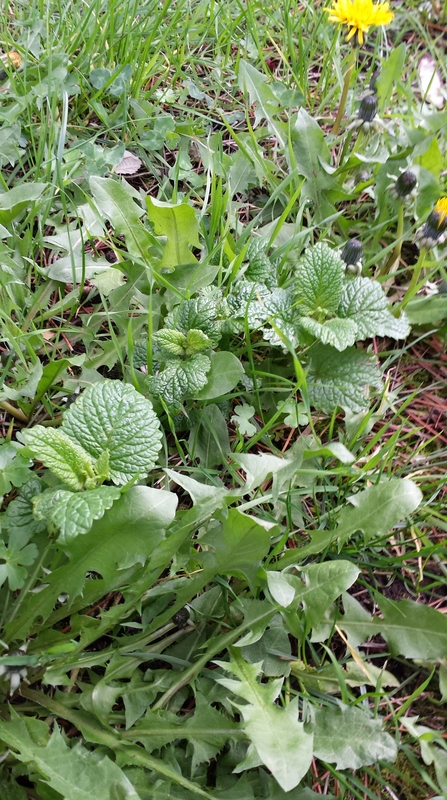 I found some lemon balm, too! Those shinier, more rounded leaves are from the lemon balm plant, and are deliciously aromatic in herbal teas and body care products. There’s the haul. Grape hyacinth grows like a weed around here, too, so I picked some for a spunky little flower arrangement to brighten my kitchen. 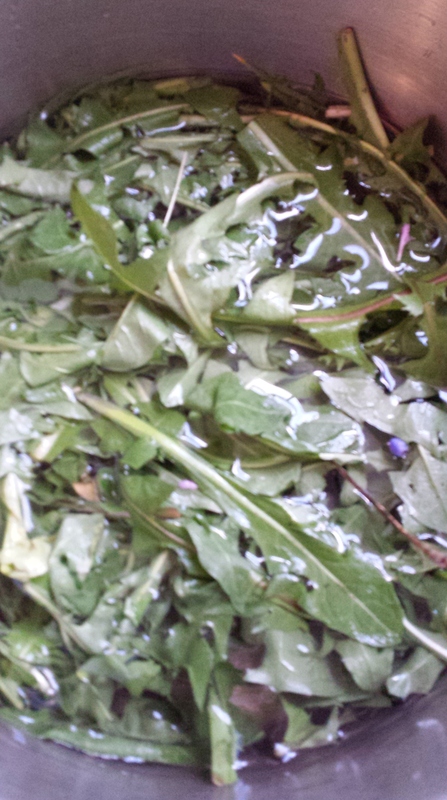 First, I soaked the greens for quite a while in a bowl of water, rather than rinsing them in a colander. Greens are tough, and they can withstand quite a bit of soaking – which is more effective at removing dirt and bugs. 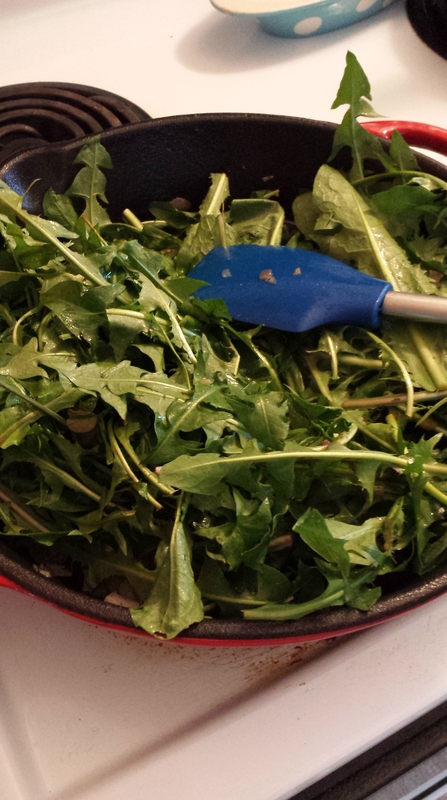 Because dandelion greens have a pretty distinctive aftertaste that’s on the bitter side, I wanted to season them really well. I couldn’t decide between garlic, onion, or both, so I went with a shallot, a member of the allium family that serves as a kind of combination between the two. 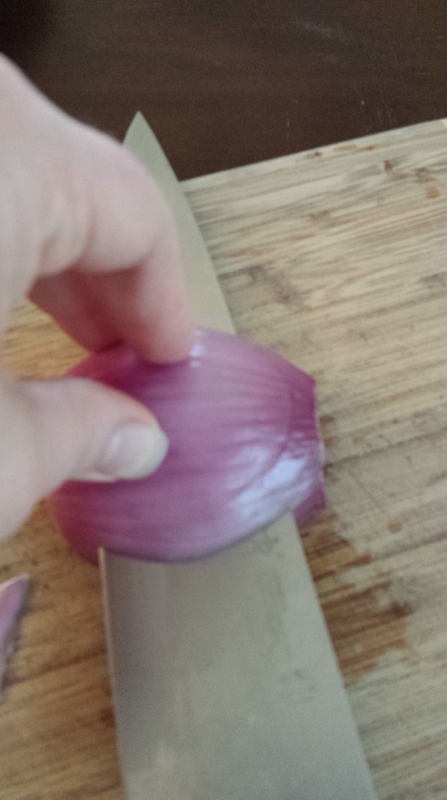 I love shallots for their delicacy; they don’t have quite the bite of either onions or garlic. Around here, they are about $5/lb in season, so I grow them myself. It couldn’t be more easy or cheap: stick them in the ground, mulch over them, and harvest them in a few months. This might be pretty fundamental for those of you who who cook at all, but I want to share one of my favorite kitchen hacks. 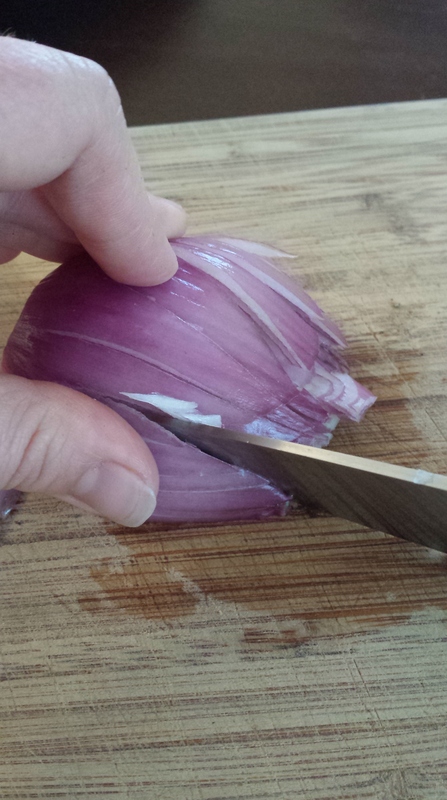 Following is the easy way to dice or mince an onion or shallot. 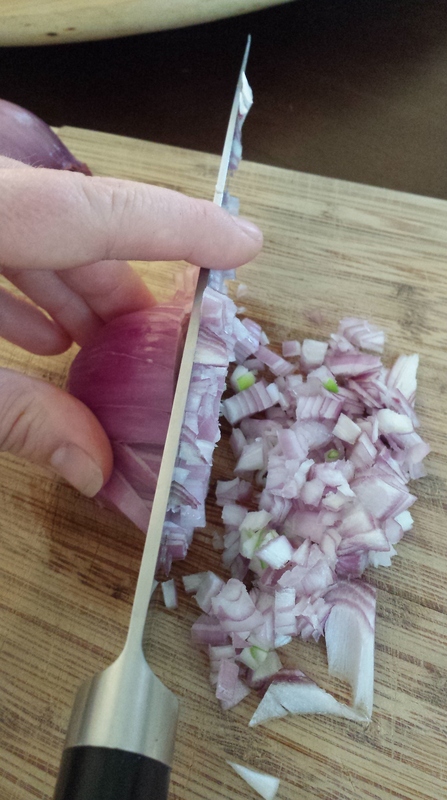 Holding the shallot steady, make long slices that go along with its “grain,” stopping just short of fully slicing it through – so it would still hold together if you let it go. Now, make slices through the center of it, moving toward your fingers (be careful! ), like you’re cutting rings for a sandwich. Again, stop just short of finishing each slice. Finally, slice away from yourself and enjoy the beautiful sameness of those pieces. Ta da! You’re on your own with that little end piece that was holding it all together. Back to the dish before us. 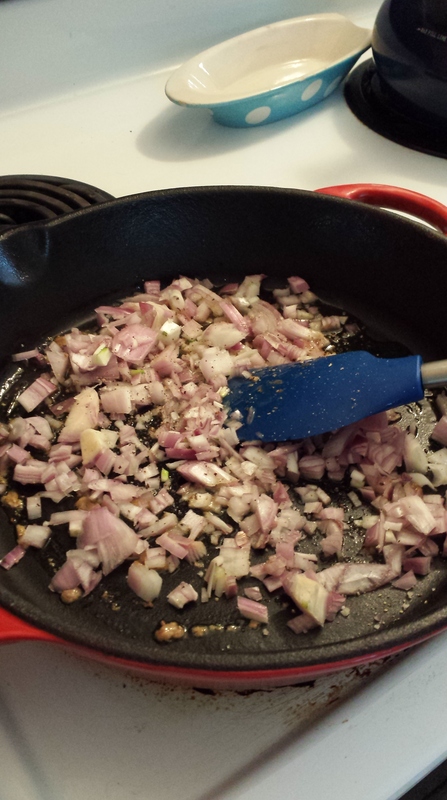 I sauteed the shallot in at least a good tablespoon of chicken fat that I had refrigerated after roasting the weekly chicken (a hallowed ritual in our home). That fat contains a delightful volume of minerals, is soothing to your digestive tract, and is SO TASTY! From an organic, pastured, or at the very least hormone-free chicken, the fat is packed with nutrients our bodies need, and aids in the digestion of all that good Vitamins A and K in the dandelion greens. Have you heard of fat-soluble vitamins? These are nutrients critical to good health, and if you are eating them without a good source of accompanying fat, you are not gaining their benefits. In the case of the Vitamin K found in these greens, we’re talking about some pretty important benefits: blood clotting, bone health, and heart disease prevention. In the case of Vitamin A, we’re talking healthy eyes and vision, a healthy immune system, and cell growth. Those are really just the beginning of the list. The bottom line: eat fat with your fat-soluble vitamins, or else. Bonus – when the fat is from a roasted chicken, it will also include all the herbs and lemon-juiciness and garlic and whatever else you used in roasting the chicken. Good God, am I tangential or what?! Back to the food. After the shallots were nice and soft, I added in the greens, which I’d just patted dry with a dish cloth. As they cooked for about five minutes, I added a splash of unpasteurized apple cider vinegar to kick up the flavor. This isn’t necessary, since the chicken fat and shallots impart such a nice flavor to anything they touch, but my tastebuds lean Mediterranean, so if I can add a touch of vinegar or brine to almost anything, I like it better. There’s my dinner in all its glory. 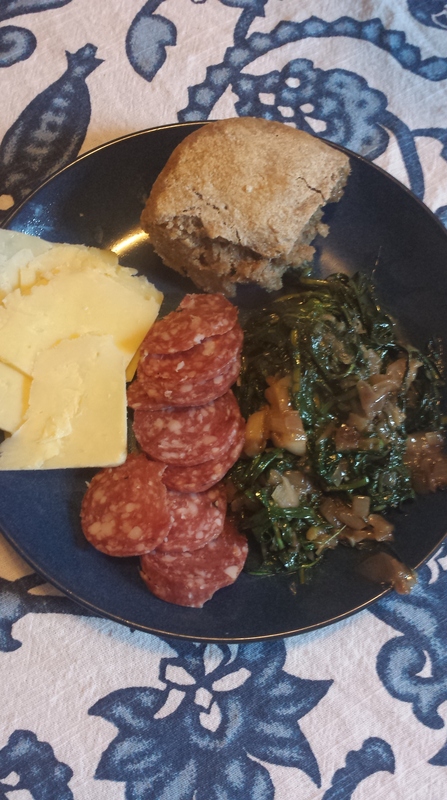 Dandelion greens, a local artisan salami, grass-fed white cheddar cheese, and a homemade bread roll. Mmm-mmm! If I’d had a dry chardonnay on hand, that would’ve been the ticket, but I enjoyed my little glass of raw milk almost as well. To keep us (me and you, my readers) in a healthy relationship, I feel I need to tell you that the greens were kind of difficult to eat. There was no lack of tastiness, but the stems cooked down to be pretty stringy. I think next time, I’d either cut out the stems, or save all that work and just make a salad. Hey, it was worth a shot, and for better or worse, I’m glad to have had my first foraging experience! 14 Apr	This entry was published on April 14, 2014 at 6:56 pm and is filed under Collection. Bookmark the permalink. Follow any comments here with the RSS feed for this post. I’m so jealous! Your wisdom and DIYness 😉 are inspiring. I’m looking at the bag of potato chips sitting next to me as I read your description of healthy fats and vitamins our body needs. Oh boy have I got a long way to go! Thank you for opening this world of healthy goodness.